Closest Accommodation to the Beach in WA, just 76 steps from your balcony. The 4 star Quality Resort Sorrento Beach is the only property on the coast that provides all room types from hotel style studios to 3 bedroom apartments. Quality Resort Sorrento Beach is located on Perths magnificent Sunset Coast, just a 20 minute drive North of Perth City. Our Huge Luxury One Bedroom Spa Apartments are located in our new hotel wing which is rated a 4 ½ Star. Relax in the generous 2 seater spa bath or sit on your private balcony overlooking the magnificent blue waters of the Indian Ocean and sandy beaches just 76 steps away for the ultimate beach retreat. Other options available are in Hotel Style studio rooms, or our 3 1/2 star 2 and 3 bedroom self contained and serviced apartments. The resort also offers a range of facilities including heated pool, spa, sauna and BBQ area, boardroom and meeting facilities and an onsite restaurant. Room facilities include Wi Fi internet, reverse cycle air-conditioning, Foxtel, tea and coffee making, desks with full telephone access, off street and undercover parking and guest laundry. 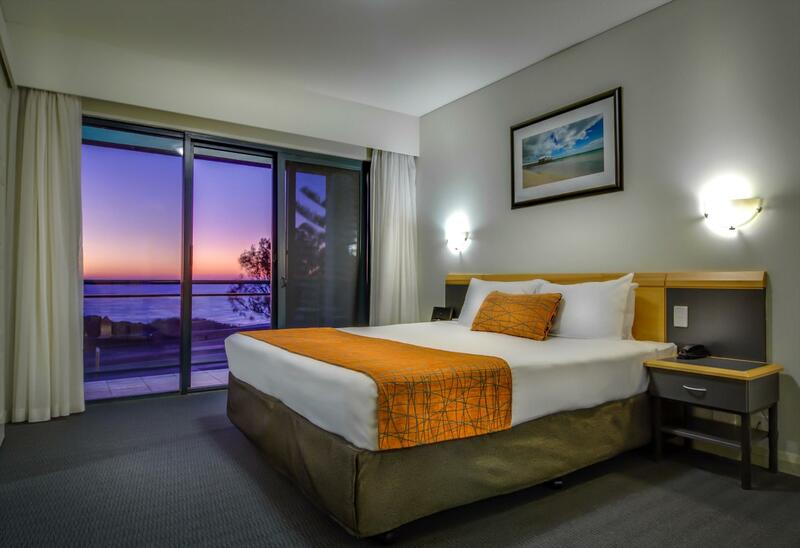 Quality Resort Sorrento Beach is 750 metres from Hillarys Boat Harbour with its shopping, cafes and restaurants, AQWA (The Aquarium of Western Australia) and Rottnest Island Ferry. World glass golf courses, major shopping centres and cinemas, Arena Joondalup and Challenge Stadium sporting facilities, are all nearby. Quality Resort Sorrento Beach can cater for a romantic getaway for 2 people, through to a family holiday for six and with our variety of room configurations provides a one stop shop for all accommodation requirements on the beach in Perth, Western Australia. Deluxe spa apartment with 1 queen size bed & fantastic double corner spa. Balcony overlooks resort surroundings. Separate kitchen/living area with a fold-out double sofa that sleeps 2 at an additional cost of $30.00 per night. Cots are available at $6.60 per night and a continental breakfast basket for $8.80 per person means you can rest easy. Deluxe spa apartment with 1 queen size bed & fantastic double corner spa. Balcony overlooks Indian Ocean and sandy beaches just 76 steps away. Separate kitchen/living area with a fold-out double sofa that sleeps 2 at an additional cost of $30.00 per night. Cots are available at $6.60 per night and a continental breakfast basket for $8.80 per person means you can rest easy. 3+ star apartment with 1 king size bed (or 2 singles) & 2 singles, sleeps 4. With separate kitchen/living area, this room type is suited to families or group bookings. It also has a fold-out double sofa that sleeps 2 at an additional cost of $30.00 p/n. Cots are available at $6.60 per night and a continental breakfast basket for $8.80 per person means you can rest easy. 3+ star apartment with 1 king size bed (or 2 singles) & 4 singles, sleeps 6. With separate kitchen/living area, this room type is suited to families or group bookings. It also has a fold-out double sofa that sleeps 2 at an additional cost of $30.00 p/n. Cots are available at $6.60 per night and a continental breakfast basket for $8.80 per person means you can rest easy. 4 star hotel room sleeps 2. 1 queen size bed with ensuite bathroom. Balcony overlooks resort surroundings. This peaceful room type has a fold-out double sofa that sleeps up to 2 adults or children at an additional cost of $30.00 per night. Cots are available at $6.60 per night and a continental breakfast basket for $8.80 per person means you can rest easy. 4 star hotel room sleeps 2. 1 queen size bed with ensuite bathroom. Balcony overlooks Indian Ocean and sandy beaches just 76 steps away. This room type has a fold-out double sofa that sleeps up to 2 adults or children at an additional cost of $30.00 per night. Cots are available at $6.60 per night and a continental breakfast basket for $8.80 per person means you can rest easy. 1 nights cancellation fee within 24 hours. 1st nights payment required with credit card number required to guarantee.